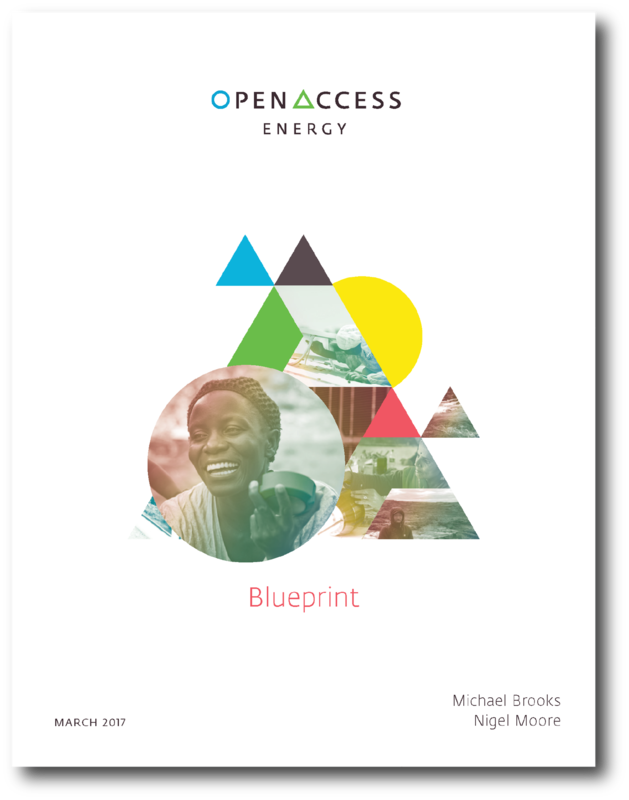 The Waterloo Global Science Initiative (WGSI) has developed the OpenAccess Energy Blueprint to achieving universal electricity access. This document is the result of multinational, multidisciplinary and mulitgenerational collaboration at WGSI's OpenAccess Energy Advisory Workshop (October 18-20, 2015), Summit (April 24-27, 2016) and further engagement with energy sector researchers, leaders and advisors. a commitment to establishing and nurturing partnerships on the road to establishing energy access. Implementing this pathway will involve creating an ecosystem in which a dynamic energy access sector can thrive. This new sector of the global economy will need thousands of new actors and institutions working across borders, with massive flows of investment, materials and expertise. It will require innovation, and that in turn will require policy coherence across nations, standardization of technologies and practices, and local entrepreneurs and end-users involved in decision-making so that service configurations match local needs and ability to pay. 4. Incubate – Create financially sustainable platforms to help energy entrepreneurs succeed in creating sustainable energy businesses that can serve even the most difficult and impoverished markets. Energy access — the Canadian context, a special section in the OpenAccess Energy Blueprint, acknowledges the role of energy as the backbone of a better quality of life for Canada's remote and Indigenous communities and our responsibility to provide the supportive resources these communities need to not only meet their current minimum energy needs but to plan for plenty. 1. Commit to a step change in investment Canada’s federal government should increase its overall funding commitments for energy in remote communities from the tens of millions to the billions in the immediate future. This funding should be seen as a priority area for ongoing green infrastructure spending programs. 2. Recognize Indigenous leadership and support capacity building In order to ensure long-term economic and social benefits, Indigenous clean energy leadership must be recognized and supported through capacity building programs. 3. Create a single, intergovernmental point of contact A single point of contact within government – whose responsibility is to ensure those initiating and managing energy projects can navigate regulations, funding and reporting at the federal and provincial/territorial level and across relevant departments – is essential. 4. Connect people, technologies and information Knowledge sharing between communities and innovative institutions is critical to success.Private and public sectors should be encouraged to utilize up-to-date information and innovative technologies to seek new arrangements for energy projects in remote communities that are financially sustainable over the long term.